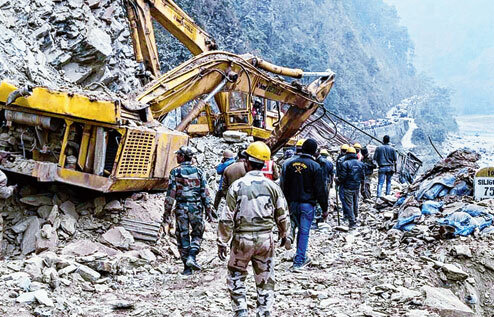 The highway connecting Sikkim with the rest of the country was opened for one-way traffic at Bhotay Bhir in Kalimpong subdivision this evening, 36 hours after a 40m-stretch of NH10 had been destroyed by a landslide. One of the five members of the family whose SUV had been trapped under boulders for four hours before being rescued died at the Central Referral Hospital (CRH) in Gangtok today, taking the death toll to two. Doctors said Passang Tamang, 25, had died possibly from internal bleeding. The Border Roads Organisation which is in charge of NH10, opened the highway for one-way traffic around 5.30pm today. 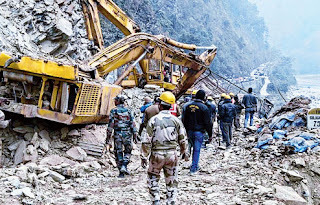 "Workers of the GREF (General Reserve Engineering Force under the BRO) and eight excavators were pressed into service immediately after the landslide to remove boulders from the highway. All five vehicles which were under the debris have been removed. As of now, there will be one-way traffic on the stretch. It may take a couple of days for vehicles to move in two lanes on NH10 through Bhotay Bhir," a senior BRO official said over the phone. Five vehicles - three trucks, an SUV and a JCB - were almost buried under boulders which had fallen off the hillside around 5am yesterday. Mukesh Chhetri, 32, the driver of one of the trucks, had died yesterday. Bhotay Bhir is about 40km from Kalimpong, 75km from Siliguri and a short distance from Rangpo, the border town in Sikkim. The incident has prompted the diversion of traffic from Sikkim to Bengal through the circuitous Mungsong-Kalimpong route. Passang Tamang had been pulled out of the SUV along with four other members of his family. He was under observation at the ICU of the CRH. "When he was brought to the hospital, there was an abrasion on his leg and other injuries on the body. He was admitted to the ICU immediately. Internal bleeding may have caused his death," said doctor D.P. Sharma. Passang was a farmer and is survived by his mother and younger brother. Today, passengers travelling between Siliguri and Sikkim through the Mungsong-Kalimpong route complained that taxis were overcharging them. "I was asked to pay almost double the fare. The drivers are asking additional Rs 200 to go via Kalimpong-Munsong route to enter Sikkim. I feel this is too much. They should not take advantage of the highway closure by doubling the fare," Binod Rai, who took a taxi today, said over the phone. It takes around four hours for travel between Gangtok and Siliguri through NH10. Through the Munsong-Kalimpong route, the travel time has increased by almost two hours. The fare from Gangtok to Kalimpong is Rs 130, Darjeeling Rs 220 and Siliguri Rs 200.